The best thing the Toronto Maple Leafs can say about this week is that it's over. The Leafs lost 6-2 to the last-place Ottawa Senators on Saturday night, concluding a week that saw Toronto lose three of four while giving up 23 goals. "A little adversity is not a bad thing," said Toronto defenceman Morgan Rielly, whose team fell four points behind the Boston Bruins for second in the Atlantic Division. "We believe in ourselves, we believe in the group, we believe in the structure and right now it's just not going well for us. It's important that we look at one another, we discuss what we can do better and get it fixed." Magnus Paajarvi led the way with two goals, while Cody Ceci, Brian Gibbons, Anthony Duclair and Oscar Lindberg also scored for Ottawa (25-41-6). Anders Nilsson made 35 saves as the Senators won their second in a row. 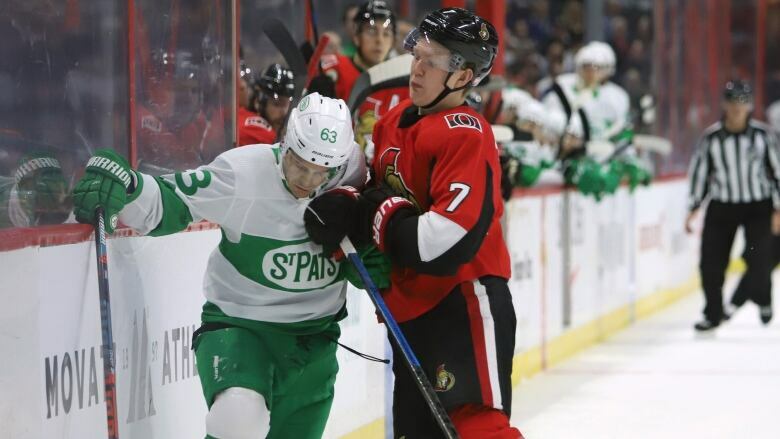 "We had four lines that all played good," said Senators interim head coach Marc Crawford. "Our leaders were really good [Saturday]. If you look at the guys that wear 'A's on the team, they were all terrific." John Tavares also scored for the Leafs (43-24-5), while backup goalie Garret Sparks stopped 38 shots. Leafs coach Mike Babcock said the team has to simplify things. "Being a pro is getting ready each and every day and doing your part. So if you're [Sparks], your job is to stop the puck and if you're a d-man it's to move the puck and keep it out so everyone just do your own job and we'll be fine." The Leafs should have felt right at home at the Canadian Tire Centre with a season-high crowd of 18,607 mostly cheering for Toronto in the Battle of Ontario. The Senators are used to seeing a lot of blue in the stands. "We talked about it a bit before and we knew there would be a lot of Leafs fans since they're having a good season and it's their first time playing here in Ottawa this year," said Nilsson, who came to the Senators in mid-season. "It was definitely a new experience for me seeing so many away fans from the visiting team in your home barn." Tavares' goal was his 40th of the season, a career high for the 28-year-old, but admitted it was hard to feel good about the accomplishment with the way things are going right now. Following a solid first period, the Senators continued to control much of the play and extended their lead to 4-1 after 40 minutes. Ottawa made it 2-0 early in the second as Gibbons jumped on a Dylan DeMelo rebound and went to his backhand as he fell. Toronto cut it to 2-1 at 12:33 as Rielly put a shot over Nilsson's right shoulder for his 20th of the season. "We capitalized on two turnovers and that's what we wanted," said Paajarvi of his two goals. "Two nice passes from Balcers and Smith and I tried to pick corners and it worked." The Senators outshot the Leafs 17-9 in the first and led 1-0 off Ceci's sixth of the season. Christian Wolanin saw Ceci trailing and he wristed a shot past Sparks from the circle. Ottawa-born rookie Max Veronneau picked up his first NHL point on the play in his second game as a professional.